The case for "reclaiming" Pietism. At last fall's biennial meeting of the Conference on Faith and History, one of the most popular sessions featured a 25th-anniversary discussion of David Bebbington's Evangelicalism in Modern Britain, with Bebbington himself responding to papers from Darren Dochuk, Mark Noll, and Molly Worthen. I didn't time it in the moment, but looking back at my tweets from the session, it seems that it took 45 minutes for anyone (Worthen, bless her) to so much as mention Pietism. All of which came back to mind as I read a book meant to remind evangelicals and those who study them what Donald Dayton, W. R. Ward, and others have already demonstrated: that evangelicalism grew out of German Pietism as much as Puritanism, Wesleyanism, or any of its other sources. And that a Pietist ethos continued to awaken, revive, and renew Christianity well beyond Germany and well after the 1700s. 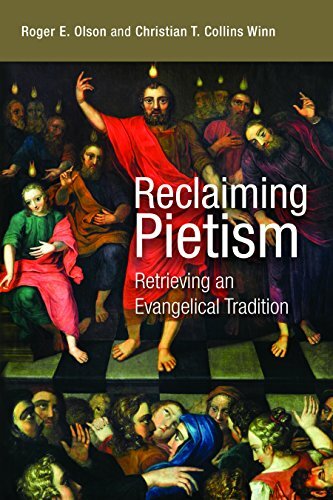 Still more urgently, however, Roger Olson and Christian Collins Winn's retrieval of the Pietist tradition is needed because it "offers contemporary evangelical Christianity a resource for its own renewal" at a precarious moment in that movement's history. But let me recommend the book before I have it solve all of evangelicalism's problems. Collins Winn and Olson have provided the best introduction to Pietism available in a single volume. (Full disclosure: both contributed chapters to a book on Pietism and higher education that I edited recently for InterVarsity Press.) Whatever the inevitable limitations of any attempt to survey so big a topic in so short a book, Reclaiming Pietism is an accessible, provocative work that will help evangelicals and other readers to rediscover a religious ethos that did not begin with Philipp Jakob Spener or end with August Hermann Francke.